Legendary hedge fund supremo Ray Dalio is in ebullient mood. Following a series of moves by Mario Draghi to underpin European government financing Dalio told Bloomberg that, in his opinion, the euro will now “likely” stay together because existing growth-constraining austerity measures will henceforth be balanced by money printing over at the European Central Bank. 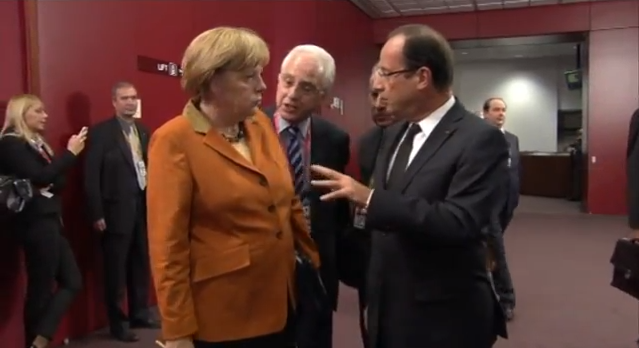 His statement was, of course, a response to ECB President Draghi’s save the Euro pledge. This story starts back in July, when Mario Draghi calmly informed a London investors conference that, “Within our mandate, the ECB is ready to do whatever it takes to preserve the euro. And believe me, it will be enough.” Since that time, of course, this gamechanging statement has been qualified and clarified, and re-qualified and re-clarified innumerable times, but still the essence remains unchanged. The ECB President wasn’t talking, remember, about any specific programme of bond purchases or exceptional liquidity measures, he was talking about doing “whatever it takes”, and Ray Dalio for one is taking him at his word. What Bridgewater’s founder was getting at when he made this assessment is that there is now no meaningful limit being placed on what the ECB might eventually do. Naturally there is the mandate to work around, but the mandate can always be changed if Europe’s political leaders see fit, and who at this point in the crisis still doubts that if needs must they will see fit. Indeed in many ways it is easier to envision a change in the EU Treaty to tweak the EU mandate than it is to envision one to establish, for example, a full fiscal union. Especially now the ECB has become the in-tray into which all the politically unpalatable and thus unresolvable issues ultimately get dumped. The most recent example of this is the suggestion that Spain applying for a precautionary credit line would be the ideal solution to the country’s current dilemma since no money would actually need to change hands, making the move easier to sell to the German parliament. No money would need to change hands because Mr Draghi and his governing council would be stepping up to the plate alone. This outcome looks and feels rather different to the “burden sharing” approach outlined by Mario Draghi during the August ECB press conference.It looks and feels different because it essentially is different, even if the two possible modalities of ESM action were laid out from the start. What wasn’t envisioned was that NO ESM money would be used to buy bonds. That the ECB would be acting alone. Of course any talk at this point about the forthcoming Spanish bailout means navigating in an ocean of uncertainty, but as far as we can see at the moment the end result of all the negotiations, crying wolf and procrastinating seems to be that the ESM won’t be buying bonds in the primary market. Instead some of the Euro Areas financial institutions (acting as brokers for the ECB) will do so and then re-sell them on to the central bank. This differs in substance from what some have referred to as ECB LTRO-style “QE by stealth” in that the central bank would be owner of the bonds, and not simply holding them as collateral. While adding considerably to central bank risk this procedure is seen as being politically more palatable in the north, and limits the sovereign bond/bank capital “death spiral” many worry about in the south, since it avoids the need for periphery banks themselves to hold more bonds on their balance sheet. But whichever way you look at it we will still see significant bond purchases, thus maintaining a kind of strange fiction that Spain still remains “in the markets”. Obviously, without ECB support in the form of LTROs and the OMT the country would be absolutely incapable of financing itself. So perhaps a better way of putting it is that “the ECB is in the markets” and hence Spain is able to finance itself. We will leave aside at this point the rather byzantine issue of whether or not these purchases will constitute “money printing”, since with the large quantities of money core European banks have sitting on deposit at the central bank the question of whether or not the purchases are sterilised seems to be a totally academic one. As London Thomas suggested in the New York Times recently, the classic work of theatre that is currently being performed on the Spanish stage does not come from the portfolio of Calderon de la Barca, but rather from an Irishman, Samuel Becket. It is entitled “Waiting For Rajoy”. However, unlike the original this modern adaptation is unscripted, and resembles more a Cassavetes film where the actors constantly improvise. Naturally the markets are unsure how to trade the situation, but with the passage of the days, weeks and even months I am sure they are steadily learning and adapting. In recent weeks an almost enless supply of ink has been spilt in the press about the kinds of conditionality which might be applied in the event of a bailout. Naturally there are questions oustanding which the Troika would like to address with Spain – the seriously needed pension system reform, for example, or the across the board wage reduction solicited by the ECB in its August bulletin – but this doesn’t seem to be the priority at the moment. The number one objective appears to be getting a firm grip on a country which has proved more slippery than a conger eel when it comes to holding it down to firm commitments. But, even if we are not party to the intimate conversations which take place on a daily basis between Mariano Rajoy and his chief economic adviser Alvaro Nadal (seen together in the photo below) it does look very much like Spain has been trying to play hard ball with Berlin. In the short term this strategy was used to some effect in Los Cabos (given the surprise element involved) and then subsequently at the June EU summit. However it now seems that this particular window was firmly closed by Angela Merkel at last weeks meeting. Over the weekend it must have been back to the drawing board time at the Moncloa, and the whole world is now waiting to see what the new approach will be. Well no, not exactly. The ECB is now committing the worst of all sins (according to the version of biblical law to be found in the EU treaty) and helping monetise Spain debt. Even worse, it is doing so with only a virtual intervention. There is no conditionality, and no support measure to withdraw, so no possibility of using a threat to do so. Mario Draghi can hardly go to the next press conference and say, “since there are no takers, the OMT programme is now formally closed”. Investors, on the other hand, don’t want to get “burned” by Mario Draghi – intervention is, after all, just a phone call from Rajoy away, so they do the intelligent thing and stand back on the sidelines. 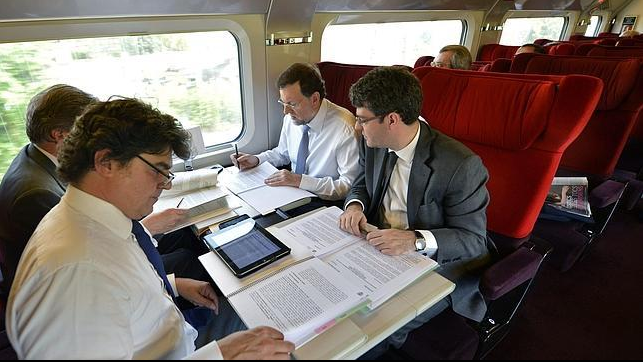 Waiting for Godot (sorry Mariano Rajoy) to decide. So, since the EU has already approved Spain’s adjustment programme, looking at the balance of forces and balance of interests I now think it is unlikely very stringent additional measures will be required when finally the big day comes. But this isn’t the point. There will be a Memorandum of Understanding, there will be supervision, and there will be reviews. This is what this tug-of-war is all about. This is why Angela Merkel went before the Bundestag last week to explain that she would propose the EU seeking powers to intervene (regardless) in countries who habitually fail to comply. She didn’t spell out S-P-A-I-N, but she didn’t have to. When the next MoU is nicely in place failure to comply with the objectives which are laid down (highly likely) will then trigger more measures during the review process, as we have seen in Greece. So there will be plenty of opportunity later. What the Troika representatives want at the moment is to get their claws on, and firmly locked into, their prey. As I say, the bailout one will not be the first such MoU Spain’s present leaders have signed, and with progress on determining bad bank asset handover prices painfully slow, while progress on the “burden sharing” involved in the preference-shares-haircut is seemingly non existent, the men on the other side of the table will surely now be adopting a “once bitten twice shy” approach. Troika representatives are caught between the rock of having to talk up Spain and the hard place of coming to terms with the country’s continuing non compliance and deteriorating reputation. I am sure Alvaro Nadal is well aware of this, hence the hard ball, and hence the leverage he is able to apply. Contagion, what contagion? 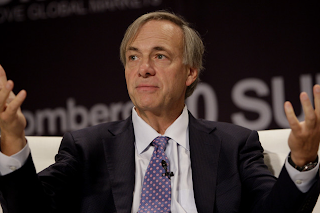 But moving away from Spain and returning to the opening theme: Ray Dalio’s ebullience. The whole issue of the OMT is mere detail, but a tiny comma in the already voluminous history of the Euro Area crisis. What has market participants really whetting their lips is the idea Mario Draghi is willing to do anything, literally anything (within the mandate, but then, if things get desperate what exactly does that mean?) to save the Euro. And believe him, it WILL be enough. If you follow my line of argument, what was meant as a threat becomes a promise. Just imagine how male eyes light up when a woman says she is willing to do absolutely anything for him to save a relationship (or start one). (Incidentally this should not be read as displaying gender bias. No woman would still, in this day and age, believe any man who said the same, at least not unless she wanted to). So investors have backed off on periphery spreads, and on the Euro. Gravy there will be. Enough to go round everyone. But leaving all that aside, what about Ray’s stronger line of reasoning that the promise of all this market fun changes the outlook for the Euro in the longer term? Does it hold? Or Mario’s promise, is it valid? Does he really have it within his power to deliver? Many men promise before the altar that they will be faithful to their wives. Often they aren’t. Later some of them learn you shouldn’t make promises you can’t keep. Can Mario keep his promise? Perhaps the view of the Euro as some kind of unexploded bomb just waiting to go off isn’t a new one, indeed in my Dr Strangelove CNN blog post I have already likened the currency union to the famous “Doomsday Machine”, designed in a way which means it will eventually blow up, but also designed in such a way that any attempt to disarm it will produce a similar outcome. But tired as the metaphor may now be I still think that it is a valid and useful one since this is still exactly the situation we are all in. Perhaps the best example of this unsung virtue has been the way in which central bank FX reserves – a traditional indicator for up and coming balance of payments problems – were rendered all but irrelevant, even though there were in fact no joint and several agreements in existence to guarantee the external debt of any of the participating, but independent, sovereigns. We all now know what got to happen next – countries which had been sustaining unsustainable current account deficits suddenly found themselves with funding problems associated with massive balance of payments crises. So what do we do? We disconnect the cables (via OMT) which served as the transmission mechanisms for the warning signals being sent by the markets, that’s what we do. This naturally puts a break on one “self fulfilling” component of the financial crisis – the one which follows the reasoning chain whereby excessive interest rates on excessive debt can drive a country into insolvency, while fear about the possibility of such interest rates in and of itself drives up interest rates, sending the country over the cliff in any event. Clearly, given this analysis, what you need to do is disconnect the worry factor. Some mistakenly call this “restoring confidence”. So the central bank intervenes to buy government debt, and stop interest rates becoming excessive, then things are just fine, aren’t they? But what about the excessive debt which caused the surge in interest rates in the first place? And what about the fact that it is not sustainable. 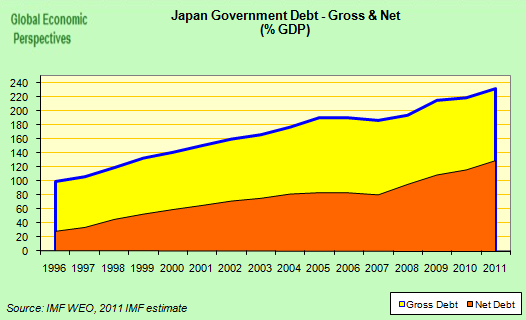 And then there is the lack of economic growth which was producing the fiscal deficits in the first place. Are these problems fixed by the bond buying programme? Of course they aren’t. That’s why people talk about OMT buying time, and why I talk about deactivating the alarm system. The bomb has still to be defused. But where are the bomb squad? Oh yes, I forgot, they are called the “men in black”, and a good job they have been doing of it in Greece. But let’s leave all these secondary issues to one side, entertaining as they are, and go right back to Ray Dalio’s best and strongest argument (since I’m sure he agrees with much of what I have just said). The heart of the issue is that Mario Draghi has vowed to do enough, and enough seems to have no limits. So what could the ECB do if we really put our imagination to work on the issue? Well like Ray argues, they could print money, lots of it, even to the point of doing it helicopter style. Those people who think the ECB is already printing money (which they aren’t necessarily doing when they increase their balance sheet) ain’t seen nothing yet. That’s what the “it will be enough” promise means. None of this is in the mandate yet, naturally it isn’t, but it could be, and it would be much easier to put more in the mandate than it would be to keep going to the German Parliament to ask for more money. So it could, and most probably will, happen.When you’re crossing that rope bridge and it starts to creak and sway then you just have no alternative but to continue moving towards the other side. We have all seen far too many movies about what happens to the people who try to turn back. So let’s imagine this is what happens, and the ECB really goes to the imaginable limits and beyond. Will it work? Will it be enough? Well this is where I think I find a flaw in Ray’s argument, and it is a very common flaw to be found in the thinking of those educated in the US monetary tradition. Ray is assuming the ECB’s eventual “money printing” will produce inflation, and that this inflation will help burn down the debt (often today this is termed “financial repression”). Whatever the pain this entails for bondholders, since in this case it is the central bank that is going to be the main bondholder (in our imaginary thought experiment) the outcome may not seem so objectionable from an investor perspective. After all, there are other assets they can get into. Let’s give an example. If I want to suffocate myself I need to deprive myself of air. If I don’t deprive myself of air I won’t suffocate. Fine. And if I deprive myself of air, does that mean I will suffocate? The answer is it depends, the absence of air is a necessary but not a sufficient condition. I need more conditions to be able answer adequately, even though I find it impossible to imagine myself suffocating without a lack of air. Something similar happens with the inflation and money printing argument. It is unthinkable of having inflation unless someone somewhere is printing money, but does that mean that printing money always and everywhere leads to inflation. No it doesn’t. Worse, in one developed country after another across the globe a lot of money printing is going on, we just aren’t seeing the inflation. Why could this be? Basically I think it is only necessary to ask this question to have already found the answer. If Japan’s demographics have got some important part to play in the drama which is unfolding there, then it is Europe which is most likely to follow, since the continent’s demography is the closest to the Japanese one. Printing money would not be inflationary on the periphery, because there is little solvent demand for credit to generate it, domestic demand remains depressed and this situation isn’t changing in the foreseeable future. And it won’t be inflationary in Germany, because German domestic demand is just as exhausted as the Japanese variety is in terms of becoming a driver of the economy there. 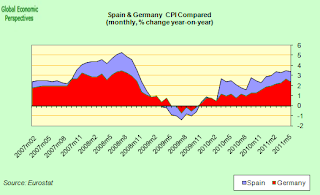 Indeed some peripheral economies have such rigid labour and product markets that headline inflation has stayed above that in Germany almost throughout the present crisis. Naturally, this is hardly good news. Which brings us to the crux of our problem, will money printing at the ECB (lot’s of it, helicopters galore) save the Euro, or simply put back the “sell by” date? Really at this point in this blog post I don’t want to reiterate the arguments I advanced in my Wolfson Prize entry, but I do consider they are more valid today than they were at the time I wrote it. The core of the issue is this. All participants ahve sunk costs from participation (whether hidden or self evident) which makes it very difficult for members states (at either end of the spectrum) to actively take the decision to leave. However, when we come to consider how the story will end, many of the traditional versions of the future seem to have been disactivated. Countries will not leave in an orderly way, and markets will not be able to win the war with Mario Draghi. Ratings agencies remain a problem, but at this point they are unlikely to be decisive. But let’s step back a bit. The Euro is a political project, and will sink or swim politically. Indeed, perhaps the most perceptive critic of the Euro experience in this sense has been Marty Feldstein, since he took the view from the outset that while the intentions of Europe’s leaders was to use the common currency formula to bring the continent closer together politically, a more likely outcome would be that it drive the member countries apart. This, indeed, seems to have been an insightful analysis, since even while Europe’s leaders give the impression of unity, what is actually going on is a constant process of, often bitter, haggling (video link here). Haggling in which moral hazard type threats play a not insignificant part. And the issue doesn’t stop with the (often visible) disagreements between the various leaders, there is a growing distance between politicians and the voters they represent. The world’s press are making great play today of this weekend’s victory by Mariano Rajoy’s Partido Popular in the Spanish region of Galicia, but perhaps the most significant point about these elections is that around half the voters didn’t vote. Another example of a similar disconnect would be Wofgang Munchau’s recent description of Bundesbank president Jens Wideman as the unofficial leader of the German opposition. So even if Europe’s leaders give the appearance of moving closer together, it is quite apparent that the people they represent – whether in the core or on the periphery – are moving farther apart. The classical fault lines of European politics are disintegrating, and democracy is weakening not being strengthened. The most recent, and perhaps clearest, example of this process is to be found in the growing tensions between Catalonia and the Spanish central government. This situation has more general interest for the current evolution of the Euro Area than the simple desire of one of Spain’s regions for independence. It has more significance, since the frustrations currently being felt in Catalonia stem from the situation of being one of Spain’s richer regions and having to bear what is perceived as being more than a fair part of the cost of the failure to resolve the Euro crisis. Catalonia is a net contributor to the Spanish fiscal system, and wants to make, at least, a smaller net contribution. The situation has been brought to a head by the fact that the region’s income-to-debt ratio has risen to the extent that government bonds are ranked at junk status by ratings agency Standard & Poor’s. Shut as it is out of the markets Catalonia has been forced to ask for a financial rescue from the central government, a rescue most Catalan’s consider to be ridiculous given they feel they are only asking for some of their own money back. He was re-iterating here the view of German foreign minister Guido Weterwelle, to the effect that German pockets are not bottomless. What Mr Pujol was inferring is that Catalan ones aren’t either. Naturally behind the Catalan independence drive there are also many identitarian issues, issues which are not easily soluble and which are making for a highly combustible environment inside Spain. But underlying the independence debate there lies a much deeper question. If Europe is moving towards a deeper banking, fiscal and political union, but moving far too slowly, why should an unfair share of the burden fall on the richer areas of the countries in the greatest difficulty? Why should more of the burden not be shared more equally and more quickly. This is not a uniquely Catalan problem, since similar issues are arising in Belgium (Flanders) and Italy (the Veneto among others). Europe is a continent of nations, and the Euro crisis is opening up the fracture lines. My feeling is that market participants are not taking all this too seriously, and that could prove to be a risky bet. The consensus view was recently expressed in a research report from UBS analyst Matteo Cominetta (summarised by CNBC correspondent Liza Jansen here). The title of the report – Can Catalonia leave? Hardly – is suggestive, and reflects what I perceive to be the present market consensus. The ins and outs of the issue are complex. Who, for example, would end up with responsibility for Spain’s massive debt burden in the event of separation? Probably Spain it seems, unless it were willing to recognise the new state. In the event of non recognition, what sort of bailout would Spain need, and would the EU be willing to provide it if Spain didn’t want to recognise its new neighbour? Would an independent Catalonia be inside or outside the EU and the Euro? This is at present unclear, the legal issues are tricky, but I think it should be remembered here that the ECB’s initial legal report on Euro exit concluded that a country leaving the common currency would need to exit the EU, and I think there is now a consensus that this wouldn’t need to be like this. Largest of all looms the question of whether the new country (were it to exist) would automatically belong to the Euro, and have access to Eurosystem liquidity. Common sense says it would, whatever the letter of the law, since the region has a financial sector in the region of 500 billion Euros (or 2.5 times Catalan GDP – ie significantly larger than Greece) and some, at least, of the institutions concerned could be considered systemic. So unless you want systemic institutions collapsing……..
Perhaps Cominetta’s clinching argument (for him) is that the Spanish government has the legal right to prevent a referendum, or veto any forthcoming law on popular consultations (of the kind which just took place in Island). In fact, to prevent an “irregular” consultation the Spanish government could go further. As Cominetta points out, according to article 155 of the Spanish Constitution, Spain’s central government has the power to stop a vote from going ahead if “a regional government does not comply with constitutional law” or “acts against the general interest of Spain.” “The Spanish government could even suspend Catalonia’s regional government”. Well, that’s fine. The ECB could also expel Greece from the Eurosystem, but will it? And is this the best way of going about things? Arguably suspending Catalan autonomy and introducing direct rule from Madrid would be the quickest way of convincing those who are still in doubt that they want to vote for independence. Naturally the has to be an easier way of handling this problem than simply uping the ante, and hoping the whole Euro Area doesn’t fall of a cliff in the ensuing uncontrollable and unpredictable chain of events. “We think after the Catalan elections on November the 25th the word “independence” will become suddenly rarer in Mas’ rhetoric”. Now the language he is using is very conscious language, and very precise. It should not be interpreted, as radical separatists in Catalonia are already doing, as some kind of backsliding. What lies behind his point, and it is a theme he stresses continually, is that the term “independence” is something of a historical anachronism in the context of the modern EU and Euro Area. What Catalonia wants are the same instruments of state as all the other nations in the Euro Area have, nothing more and nothing less, but this doesn’t necessarily mean “independence” as many have traditionally understood the term. It does mean, however, and for example, that as long as there are still national central banks to intermediate regional (by regions here I mean places like France and Germany) financial systems, then Catalonia as a nation which in coming to full maturity wants one too. Naturally all this looks like a huge mess, and a growing one across the Euro Area. That is just the way it is going to be, but people should have thought about all the longer term ramifications before creating the Euro, since whichever way you look at it, the Euro and its problems form the backdrop to what is now happening in Catalonia. If full political union had been achieved first, this kind of thing would never have started happening. But it is happening, and the will of a people to express themselves in a vote won’t be stopped by simply telling them they can’t have one, a point which President Mas iterates and reiterates constantly. How then does all this now start to pan out? Well first we will have elections next month. President Mas’s party, CiU, will win, and the only issue is really whether they have an absolute majority or not. Between 60% and 70% of the deputies in the new parliament will be in favour of holding a vote, and of voting yes. And on the question of the vote the CiU programme is very clear, one way or another it will happen, and indeed they are holding these elections exclusively to get the mandate needed for that vote. So if they didn’t have one the electoral process would have been meaningless. But in one sense Cominetta is right. The coming confrontation isn’t going to be about money, it is going to come be the right to have a vote. In my opinion the outcome of that vote when it is held is not really in doubt. However, instead of going off into the realm of conjecture, and speculation, and coming up with ever more grotesque scenarios, I think it is better to await developments, since they surely won’t be that long in coming. The only sensible way forward I see here is for the EU, when it takes Spain in for a bailout, to act as intermediary, take the head of the table, and organise negotiations between the two sides. I think if they can’t do that, then the Euro may well come under threat much sooner than anyone is contemplating. So to answer the my own question set at the outset – “can Mario Draghi keep his pledge?” I would say, go ask the Catalans. There are some problems that simple money printing won’t solve, and the quantity of these problems in the Euro Area is growing, almost by the day. My next comment is on Catalonia. Thank you for clarifying the situation to English readers, so often misled by incompetent, appallingly superficial commentarists. What you say is correct in my view. One should insist that Catalonia has asked for a bailout of 5,000 million euros from Spain, while every year the surplus of the transfer from Catalonia to Spain amounts to 16,000 million. The big question is "should Catalonia really try to stay in the Euro?" in my humble opinion we would be much better outside of the Euro mess and away from the ECB grip. you mean "should they stay with Spain" not "the euro." Catalonia has no choice in what currency it uses. My current experience with several local currencies in Catalonia, similar to the newly born Bristol Pound or the older Brixton Pound, shows that it is both easy and fruitful to have your own currency. Sure, a 200 billion economy like Catalonia's would take a lot of preparation and people education to jump out of the euro bandwagon, but it is feasible and in my view advisable. Catalonia will have a choice indeed, if and when she is allowed to decide. Welcome back, Mr Hugh. I am happy you are here again. And I have not read all yet, but have already spottet the rope bridge and the alarm system and its cables. An interesting post. On the Catalonia front I must strongly disagree with your opinion. I see things from Germany, though. Here the UE is considered mainly a political project to avoid the next recurrent European war, as Kohl put it when proposing the Euro against the (unchanged) will of the Bundesbank. And this idea remains as valid today (of not more) as it was then. We had concentration camps and mass executions in Europe till very recently in ex-Yugoslavia. So, if Germany, France and others were to allow Catalonia to split, Bavaria, Flanders, Süd Tyrol, etc. will follow. The political benefits of a united Europe far outweigh the economic costs. So I really believe the Catalan adventure is sort of silly and narrow minded. I won't disagree with them arranging a different fiscal pact with Spain, but my guess (I don't know the details) is that Catalonia probably knew how much money they were getting every year from Madrid, and therefore they probably overspent it. Maybe the agreement was not fair, but because I think my paycheck is unfair doesn't mean I have the "moral right" (or any right, really) to go on overspending and then feel I should get away with it. But I am happy to read your clarifications, as I said I am not an expert in Catalan matters. 1) An independent country until a military defeat by the Spanish and French joint armies less than 300 years ago. A defeat never accepted by Catalonians. 2) Spain has tried to assimilate Catalonia since then, without any success, and treating it with higher taxation than Castilian Spain because of "right of conquest". The excess taxation amounts to 300 billion (US) Euro since "democracy" was reinstated in Spain, the bleeding having caused Catalonia to slip from 1st rank to 8th in 30 years, per capita income. 4) Spanish government has repeatedly made campaigns in Spain of the kind "do not buy Catalan products" (!!!) and the Party in power has made in cities and villages signature collections "against Catalonia". Honestly, no other piece of Europe is more entitled to end an unbearable state of affairs. Could you, Mr. KR, live in a country that despises you and your fellow citizens to the point of breaking your car if you travel to deep Spain? The real problem is that Catalonian people are more affluent, better educated, very peaceful, staunchly cooperative… too much for envious Spaniards, who wield power. Mr Hugh, I have been following you since 2007, and of all the pundits and prognosticators out there pontificating on the probable future of our lot, you have proven to be one of the most clear-eyed of them all. I read a lot of them every day: Yves Smith, Felix Salmon, Barry Ritholtz, Matt Taibbi, the folks at FT Alphaville and Minyonville, Cullen Roche, Claus Vistesen, Mark Thoma, Simon Johnson, James Kwak, and all your esteemed colleagues at EconoMonitor. Keep up your fantastic work. You are a treasure and deserve a much wider audience. do you read me as well? You suggest M Draghi's "…whatever it takes" may include “money printing”, as if this were a last resort. This opinion appears shared by everyone I've read so far. New money spent by government does not remain in circulation to generate spiralling inflation, as it is recovered by the government via taxation after a lag. For convenience, assume an aggregate money-movement tax on manufacture and purchase of a commodity of 50%, and a money-circulation period of 1 month. By 3 months, around 7/8 of the purchase price has been withdrawn from circulation; the lifetime of the impulse is around 2 months, so any inflationary effects are limited and can be managed almost month-on-month. In a recession, government can obtain commodities via the spare capacity present (no capex). As a large customer for enterprises with poor orders, it can control unit prices to non-inflationary levels. If it restricts its purchases to necessities given to the dependent and poor, these are unlikely to be sold on, and the benefit is direct and immediate. Any spending stimulated by this will be taxed away also. Purchases might also be untradeable items such as free basic transport or communications. Pensioners, the involuntarily unemployed, commerce, and its employees, all benefit directly; these are voters. Where new money is printed for this purpose, it all returns to the government for re-spending or witholding as needed. In contrast, if the money is from sale of government securities, it returns finally to the financial sector (plus new money as interest? ), so its inflationary effects depend on the behaviour of that sector. This indicates that substantive government spending can occur with prompt, effective and sustainable control of inflation. In your example, you depict the Catalans as moving towards laager mode, conserving institutions and wealth together, as they distrust "outsiders" (the Spanish government etc). What would their response be to "outsiders" bringing not austerity but money, freely spent where it enables most? Splendid isolation might lose its allure. To what extent did economic woes precipitate the fragmentation of the USSR and Yugoslavia? How says that the "money printing" right now isn't inflationary in the sense that it is preventing deflation. 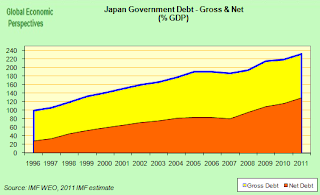 Does it matter how much money you print when Europe is in a recession, the United States has anemic growth, and Japan and China are stagnant? Wouldn't "money printing" only cause inflation if there was an economy experiencing enough growth to absorb that money? Interesting post. I think I have an explanation of the Japanese syndrome that replies to both Mr. Hugh's and your own post, Mr. Shaw. I'll post it soon. slamming the barn door shut after all of EU Incorporated has left. I say again: you do not want to own anything denominated in euros. IN PARTICULAR ITS DEBT. If Mario Draghi continues down this path he will force ALL EU members to abandon the euro and not just "everyone but Germany." If that should happen (and Mario Brother number two seems to imply this by spending most of his time in Brussels) then the only "fiend" available will be the Americans and perhaps the British and their massive amounts of armour. Clearly democracy is failing in the EZ save for Germany (ironically enough. Must be Bismark's progressivism is finally paying off!) anywho "look out below" as the blow up in Gaza is going to be "one for the ages." can't wait for the Olympics in the Caucuses either! from a historical point of view, most of your arguments are highly questionable. You can find in history many reasons to argue for an independent Catalonia (ie, different economic structures and culture, political tradition and so on). Besides, you can also find reasons on the simple fact that Spain has not really tried to integrate Catalonia in its project, but overwhelmed it. Sadly, you, Catalans, for centuries have had to put up with the unpoliteness and contempt of a country (Spain) that does not recongnise your value. It's really sad, I wish it could have worked. But anyway you have no reason to depict such an image of Spain, that is simply false. I understand your comments, because History has been falsified to make us believe we have always been a province of Spain and that's the story you have been told. For instance, the official Spanish history of Catalonia says that after the discovery of America there was a sharp decline in the power, trade and industry of Catalonia, which shifted to Castile. Well, it has just been discovered that the shipyards of Barcelona, les Dressanes, that were thought to be from the 14th century, were pulled down and rebuilt twice as large in the 16th Century, proving an unsuspected strength and dynamism of Catalonia at that supposed "decline" period. There are now several teams delving in the matter and you'd be surprised at what is coming out, really astonishing facts are coming to light that prove a permanent "reason of state" changing historical facts with Orwellian pervasiveness. Catalonia was an independent state even after the marriage of king Ferdinand to queen Isabelle, in the same sense France is an independent state within the EU, exactly the kind of independence we want from Spain today. Your next complaint is partly correct: the Spanish Government has never asked not to buy Catalan products, but the ruling party, the PP, has, and more than once. Is difficult to guess how will end the mess of a trial to do a referendum of independence. Anyway sure that Spain would never accept any intermediation from abroad. If belonging to euro or even the EU hinders to act against an independence pustch from A. Mas, Rajoy would leave the Euro, and Europe if necessary To have free hands for using the force to maintain the unity of the state. i still think the problem is a massively OVERVALUED euro. simply saying "we will do whatever it takes" does nothing while the USA gets away with murder with not only devaluing with impunity but monetizing the debt simultaneously while it does so. while i still think there are massive price increases across the board in store for Americans come January unless the said "economic cliff" is not resolved in the next few weeks in "Europe" they seem hopelessly "Tangled up in Blue" right now. Obviously certain prices are already sky high in europe. God forbid if the USA has a sudden bout of "price flu" that is…unlike right now…"merely food and energy related" but across the board. the implications would be vast…but i think most specifically it would put a dagger through the heart of the euro as some type of "sound money." my guess would be "long Loonie" as Canada offers all the advantages of a Civil Society with all that shale oil to boot. i agree they lack the industrial capacity of the USA….but law and order left South of Border decades ago. Your money is not safe in the USA.